It doesn't matter what you play, Loyalist or Chaos, this guy strikes a nerve with both. 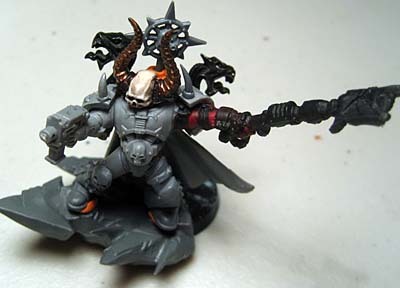 He's a Dark Apostle conversion for a friend of mine. It's interesting to look at the amount of work that goes into a "simple" conversion. If you're a Loyalist, nothing stings more than knowing one of the purest leaders you trusted to keep your men safe has turned to the other side. If you're Chaos, nothing makes you happier than knowing you've been able to sink your claws into one of the pillars of the Space Marine organization. Me personally, I've always loved the background behind this model. When I got the chance to build one for misterjustin, I jumped on the opportunity. He sent me a pic of one of his Renegade troops along with some pics of what he had before. 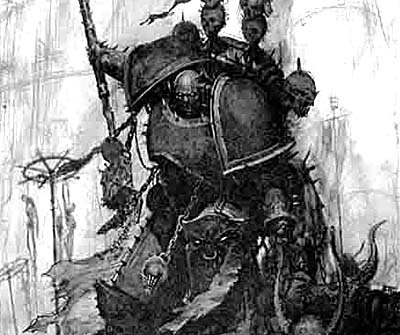 I'm not normally one for fluff, but what I really want to see in a Chaos army, entirely for fluffy reasons and not because it's a solid list, is a group of renegade Marines led by a Dark Apostle. I created an Imperial crozius specifically so it could be defaced. I will likely wrap it in my brass etch razor wire as a final step. 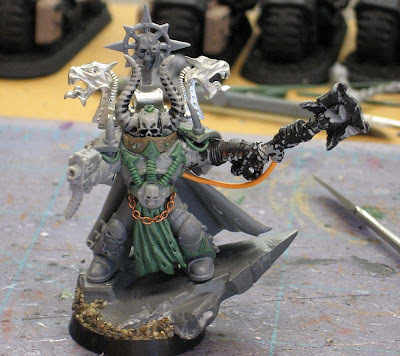 I wanted a Chaplain more than a Chaos Marine and needed some help getting the details right. He will compliment a ragtag group of renegade Marines painted in their Chapter colours. These are the two pics he sent me. One of the previous version of the model and the other being a sketch of what he wanted done with his chest armour. You an click on the images below for larger versions. 1. Cleaned paint off of the bits that needed it. 2. Cleaned all the mold lines off the model. 3. Trimmed the back of his helmet so it would fit in his collar better. 4. Sculpted a vent on the top of his helmet and added a stud to it. 5. Built a collar and studded it. 5A. Attached helmet and greenstuffed under it for correct height. 6. Sculpted new chest vents and studded them. 7. Trimmed the back of his left shoulderpad to allow the backpack to fit better. 8. Sculpted the front corner of his left shoulderpad to mimic his right one. 9. Added the horn to his left shoulderpad like the right side. 10. Trimmed both shoulderpad flanges to allow the horns from his helmet to sit correctly in his new collar. 11. Cleaned up his right wrist connection and glued his hand in place. 12. Drilled out the gun barrel (to include muzzle brakes on sides) of his pistol. 13. Changed the pistol from having a clip to being belt fed. 13A. Trimmed right wrist (pistol hand) to correct angle before gluing in place. 14. Sculpted power cables under each shoulderpad. 15. Shortened and repinned his crozius. 16. Added power cable from crozius to torso. 17. Sculpted connection point for crozius power cable on torso. 18. Added icon (pinned) to backpack. 19. Added backpack to model (pinned) with greenstuff joint to fill gap. 20. Removed (filed off) cord hanging on back of cape (not shown). 21. Added damage to inside and outside of cape. 22. Sculpted design on bottom of left greave. 23. Sculpted half tabard (with matching damage) on front of model. 24. Sculpted connection points on waistline for chain link belt. 25. Cut and added chain link belt and studded connections to waist. 26. Trimmed up Chaos icon to fit on 25mm base. 27. Added sand to base along with Chaos icon. And that's about it for this "simple" conversion. Beautiful as always Ron, thanks for the list of steps you did, it is fun to look at conversions, but even more interesting to read how people get there. BJ: Thanks. I realised I've never laid out al the stuff I do when I convert a model and most times, I just tell someone something like I'll be adding a tabard and making his cape look war torn. I leave out all the little steps I do. It is definitely helpful to set up a list of steps for a conversion. 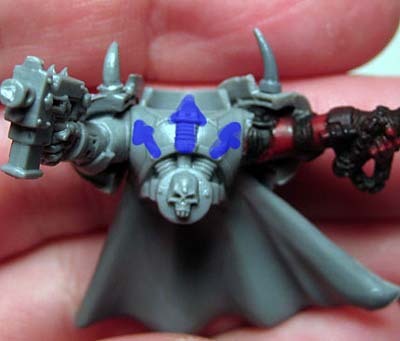 I've found that out myself recently as I work on repurposing marine models for my new vision of a 'counts as' Space Wolves army. Even the little things are hard to quantify if you don't figure out the steps taken to get to the end. Great work on the Dark Apostle! Elbrun: Right, not only do you have to know what things need to be done, you really need to know what order to do them in. Can I ask Ron how you get the little Greenstuff cables on the shoulders to stay put? I have tried to "press" them onto the model and them smooth them out, but it's not working well. Munky: They are cut a bit longer than needed at first. I start by placing one end in position and pressing it down into place. This crushes it, so I have to reshape it unless the joint will be hidden later on. Then I position the cable where I want it (trying not to adjust it any more than necessary). With it in place, I cut the other end to fit and press it down in position. If I have to press the cable down on the surface, I am careful how much pressure I use so I don't deform the shape. Sometimes, I'll use a thin wire for reinforcement ad sculpt around that. Cheers mate, It's very useful to gain some insight into how other people have overcome a problem. I may have to Press the veins on and sculpt over the squished bits. Munky: I can see about doing a tutorial on this in the coming weeks. I have a model I am working on that will have this on it and I can go through the process better. Another option to make greenstuff stick to exactly where you want it. Super Glue. Place a very small drop of super glue along the area you wish it to stay, put the green stuff on the glue, let it dry for 10 minutes then work it. It will stay in place, and actually helps it to bond to the surface much better than just green stuff alone. Interesting, I actually try not to mix them unless I'm putting together a joint or attaching something to the model after it's already cured. Working the two things together for me has never really worked out in my favor. Nicely done overall. Very good green stuff job as well and a comperhensive step by step guide. Keep up the good work! Thanks Antipope. Once I saw everything written down, I realised how much went into it myself. So much of it goes unnoticed by me most of the time. I just take all the little things for granted like cleaning edges and such. Another great piece, and way to show the love for the Word Bearers. Smurf: Thanks. I've always loved the Word Bearers myself... when this chance came along, it was a no brainer to do it. As the recipient of this model I want to make sure everyone knows I love the results too. In fact within hours of receiving the package I had this guy primed and his armor started... despite the fact I haven't had time to paint! 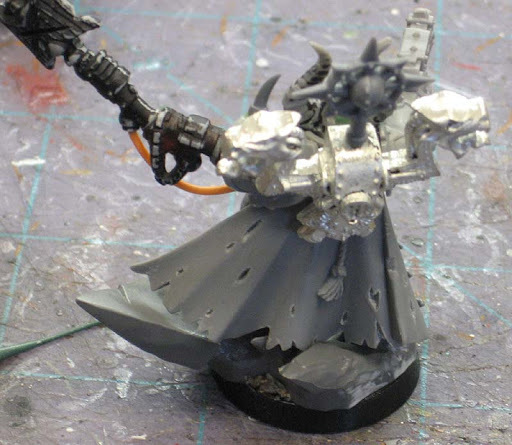 He's not officially a Word Bearer - just a Lord with power weapon and bolt pistol I'm fielding as a renegade Chaplain. It should work well on a table with a motley crew of renegade Marines in their chapter colours. What a great looking conversion Ron, nicely done. It's always an attention to the details that makes the "simple" ones pop. Looks great Ron! Is it possible to give us a quick rundown on how you sculpted the tabard please? I'd love to know how to get a look like that. That's a great looking conversion. I'm going to have to have a go at that tabbard. The last time I tried one it looked like a giant bogey stuck to the guy's crotch. Awesome mini. I got to see it Monday in the flesh (plastic) so to speak. Great piece of work. Dave: Thanks. I've learned over the past year (and even more so recently) that it's the tiny details that really do it, not the huge changes that are made to a model. Frag_Dad: Sure, I can do a tutorial on it. I may have one elsewhere, but I've refined my approach to make it even quicker and easier. Roll With It: There are lots of ways to get tabards sculpted, I sort of cheat when I sculpt mine since I'm not that good at certain methods. Marcus: So you'll most likely see it painted first too. Misterjustin is going to send me some links of the finished model so I can see it when it's done. He was contemplating taking it apart so he could paint inside surface of the cape... I made the mistake of assembling everything without checking with him first. Hey ! just wondering, what did you use for the skull helmet :D ? Anon: To be honest, I'm not quite sure. It came to me like that... all I did was add a bit of greenstuff to the top as a design element.